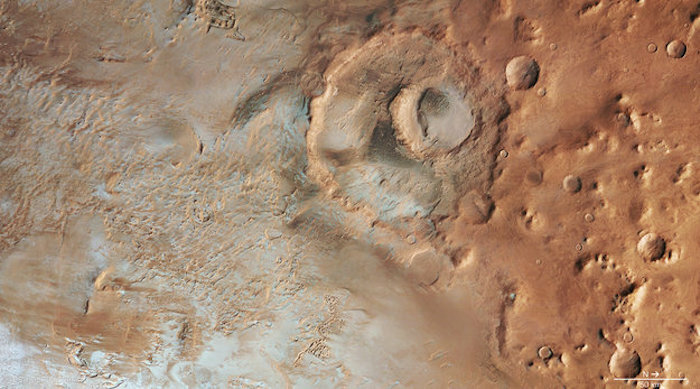 Over billions of years, the southern uplands of Mars have been pockmarked by numerous impact features, which are often so closely packed that they overlap. One such feature is Hooke crater, shown in this frost-tinged scene, imaged by ESA’s Mars Express during winter in the southern hemisphere. Hooke crater is located near the northern edge of the 1800 km-wide Argyre basin – one of the most impressive impact structures on Mars, excavated in a giant collision about 4 billion years ago. Sitting in a FLAT part of the basin known as Argyre Planitia, Hooke crater has a diameter of 138 km and a maximum depth of about 2.4 km. It is named after the English physicist and astronomer Robert Hooke (1635–1703). Hooke crater comprises two different impact structures, with a smaller impactor blasting a DEPRESSION off-centre in the floor of a larger, pre-existing crater. 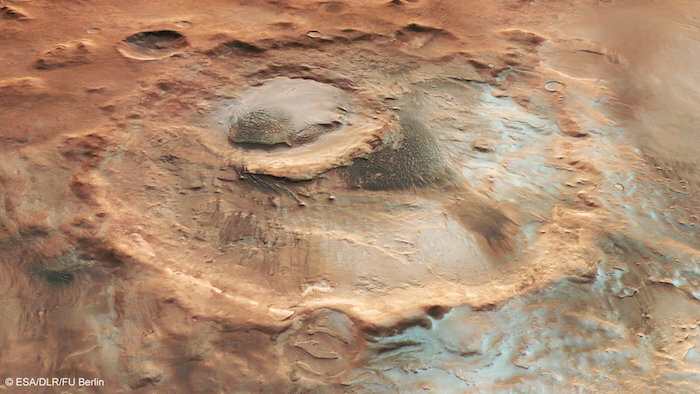 The newer crater in the centre is filled with a large mound topped by a dark dune field. The mound appears to be composed of layered material, possibly alternating sheets of sand and frost. Dark dunes also spread southwards (to the left in the topographic, main colour and 3D images) from the smaller crater, partially covering the floor of the main crater. The local topography modifies the airflow, serving as a sand trap for the wind-blown sediments. Hooke crater is located at about 46°S / 316°E, near the northern edge of the 1800 km-wide Argyre basin, one of the most impressive impact structures on Mars. The crater, with diameter 138 km and a maximum depth of about 2.4 km, is situated in a FLAT region within the basin known as Argyre Planitia. 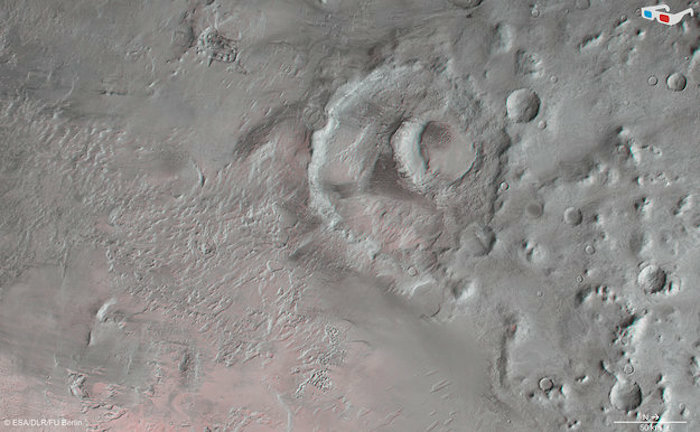 The region was imaged by the High Resolution Stereo CAMERA on Mars Express on 20 April 2014 during orbit 13 082. The smaller rectangle above outlines the region highlighted in the associated Mars Express images. 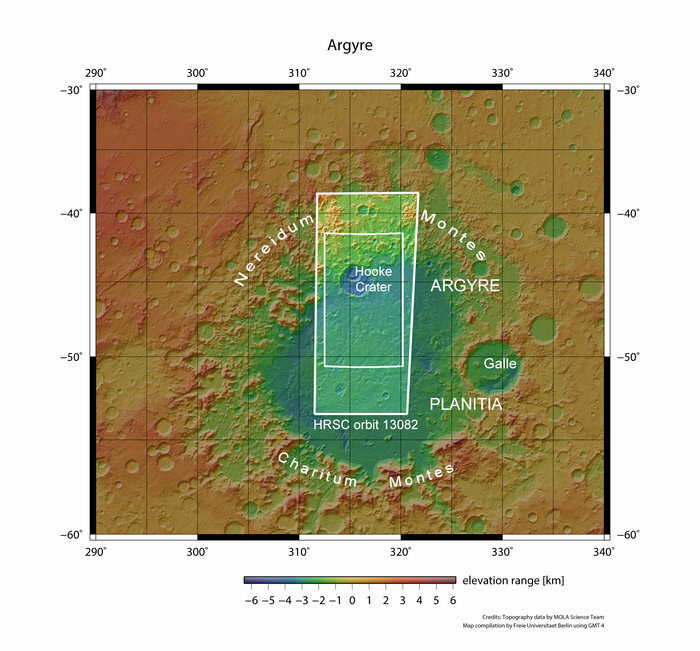 Colour-coded topography map of a region of the Argyre basin, featuring Hooke crater and part of the floor of the basin known as Argyre Planitia. White and red show the highest terrains, while blue and purple show the deepest. The image is based on a digital terrain model of the region, from which the topography of theLANDSCAPE can be derived. The region clearly slopes to the south (left). The image was acquired by the High Resolution Stereo CAMERAon Mars Express on 20 April 2014 during orbit 13 082. The ground resolution is about 63 m per pixel. Hooke crater is located at about 46°S / 316°E. North is right and East is down. In these images, much of the low-lying region to the south, as well as the central mound inside Hooke crater, is covered with a thin, white coating of carbon dioxide frost. At higher elevations and on north-facing crater walls, the frost is largely absent and appears only in areas shaded from direct sunlight by the walls of smaller craters. Outside the crater, there are a number of linear features visible on the floor of Argyre Planitia, on the south (left) side of the topographic, main colour and 3D images. These are examples of ‘yardangs’, rocky ridges that have been shaped by prolonged wind erosion. Most of the yardangs are oriented towards Hooke crater, indicating the prevailing wind direction. Also visible on the floor of the Argyre basin are small areas of chaotic terrain, which resembleDEPRESSIONS containing flat-topped mesas, buttes and hills. 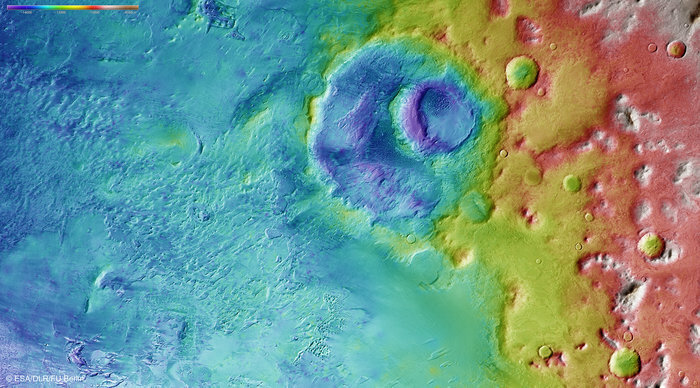 In the topographic, main colour and 3D images, one of these regions can be seen at the top edge, about a third of the way from the left, and another in the lower middle part, down from the left-most edge of the crater. Chaotic terrains like these are thought to have been created when large-scale melting of ground ice caused the ground to collapse. Where the terrain has not collapsed completely, the larger mesas may still contain substantial water ice. Clearly, this region has been greatly modified by natural forces since the dramatic impacts billions of years ago that formed the Argyre basin and, later, the pair of Hooke craters.